﻿ How to Repair Your Grass After it Has Been Burnt by Fertilizer - Read This! Excessive or careless fertilizing can do such a significant harm to your lawn to the extent of totally killing it. So it’s a must that you fertilize your lawn responsibly if you want to keep its health and beauty. 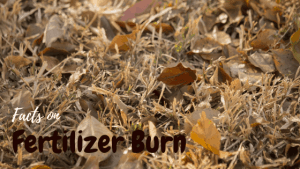 What is fertilizer burn in grass lawn? Mineral salts are what make up chemical fertilizer. These salts build up in the soil when you over fertilize and causes the grass to turn yellow or brown which is usually called fertilizer burn. Though fertilizer burn isn’t always fatal, it would be quite hard to predict if you lawn can recover as it would depend on the amount and type of fertilizer applied, the moisture available, the overall health of your lawn and most importantly on how quickly you address the situation. In general, a slightly yellow lawn is likely to recover while a crispy brown grass may not. How to treat fertilizer burn? Below are some actions you can do if you accidentally applied too much fertilizer on your lawn. Remove fertilizer. If you used granular fertilizer and it’s visible, pick up a wet or dry vacuum and recover as much fertilizer as you can before it dissolves into the soil. Apply water. Turn on your sprinklers as soon as you notice fertilizer burn. Water will do a great job to dilute and flush the minerals salts away from your lawn’s roots. On the first day, water your lawn until the soil can’t soak in anymore. Do it every day for about a week. Doing it in the morning can help reduce the risk of fungal diseases. Observe. After doing the above steps, there’s nothing much you can do but to wait and see if your lawn will recover from fertilizer burn (hopefully it will). But in case where it didn’t, you’ll have no other choice but to replant new grass to replace the dead blades. If there’s plenty of planting time left, like if it’s early spring, then you can go ahead and replant. Either overseed thin spots and sow seed or sod in large dead areas. How do you prevent fertilizer burn in the future? Use organic fertilizer. Organic fertilizer and well-composted amendments are broken down by soil microbes according to nature’s timeline. This significantly reduces the risk of fertilizer burn. Read, understand and follow fertilizer instructions. It’s a must that you apply the fertilizer exactly as described on the package instructions. Different fertilizers have different strengths, so it’s important that you follow instructions to ensure you won’t over apply them to your lawn. Reduce lawn stress: A lawn in poor condition should be fertilized very lightly to help it recover and regain its health. Fertilizing heavily can do more harm than good to your lawn because weak grass is easily burned by chemical fertilizers. It’s also important to note that lawns that are suffering from severe stress due to drought, heat or disease shouldn’t be fertilized because it won’t be absorbed and will only cause further damage. Fertilizer burn is a condition that can be very well-avoided by caution and enough knowledge. So arm yourself with pertinent information and fertilize carefully! Ready to fertilize your lawn? Shop for appropriate products at Fertilizers for LESS Now!